Obama was sitting in his office when he received a call from his friend Hellboy. He has a flu and can't join Obama in the great battle to resist the Golden Army, but that didn't disappoint the president at all. Deal with that problem and find Prince Nuada! What would you do if there was the Golden Army at your gates? 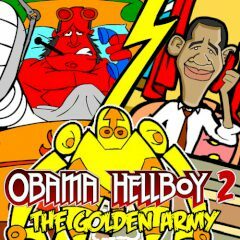 Obama considers himself as a protector of all humans and he has decided to take the place of Hellboy, while he is sick. Figure out, what you should do to prevent the Golden Army from conquering our realm. Go out and collect information as long as various items that might be in help later on!